It’s to be expected that Elon Musk and his colleagues will want to toast the first launch of SpaceX’s new rocket, the Falcon Heavy, after more than five years of delays. But excitement for the long-awaited launch has gone far beyond space nerds and Musk enthusiasts: Nasa has sold out US$195 tickets to a viewing party featuring a champagne toast and a commemorative glass. The Falcon Heavy — the most powerful operational rocket in the world — could launch for the first time as soon as 6 February. Musk’s message on Twitter over the weekend specifying a launch date anticipated a public turnout in Cape Canaveral, Florida: “Easy viewing from the public causeway.” The spectacle has even tempted a five-year-old fanboy into begging Musk for tickets, and the Kennedy Space Center reported a website jam as would-be watchers scrambled to buy their way in. SpaceX’s new, larger rocker is a reusable “super heavy” launch vehicle that will allow the closely held company to bid on heavier payloads, such as larger commercial satellites and national security missions. It could also one day send paying tourists on flights around the moon. It’s not the rocket that could eventually take humans to Mars — that’s the “Big F—ing Rocket” Musk announced in September. But the Falcon Heavy’s maiden flight is targeting Mars orbit, bringing Musk’s Red Planet dreams into reach. In terms of design, SpaceX’s first new rocket since 2010 is basically three Falcon 9 rockets strapped together, tripling the launch power. While one Falcon 9 has nine Merlin engines in its first stage, Falcon Heavy has 27. That’s more than 2.2m million kilograms of thrust at liftoff, which Space X says is equivalent to roughly 18 747 aeroplanes. It’s twice as large from a capacity perspective as its closest competitor, United Launch Alliance’s Delta IV Heavy. First announced in 2011 with an initial demonstration flight scheduled at the time for late 2012, Falcon Heavy has been a long time coming. The project took a big leap forward in December when the massive rocket went vertical at 39A, the historic launch pad at Florida’s Kennedy Space Center that sent Apollo astronaut Neil Armstrong to the moon. Last week, SpaceX successfully completed the “static fire”, a key test where all first-stage engines are ignited and fired at full thrust while the rocket itself stays on the ground. After the 24 January engine check, Musk tweeted that the maiden launch would take place “in a week or so”. SpaceX said it’s launching a different mission — a Falcon 9 carrying a customer satellite — on 30 January from another Florida launch pad, suggesting Falcon Heavy may not blast off until early February. The Hawthorne, California-based company already has paying customers committed to flying with the new rocket, including commercial satellite operators Arabsat, Inmarsat and Viasat, its launch manifest shows. The US Air Force also chose Falcon Heavy for its STP-2, or Space Test Programme 2, mission. Falcon 9 won US Air Force certification for national security space missions in 2015, and Falcon Heavy will go through a similar certification process after the test flight. 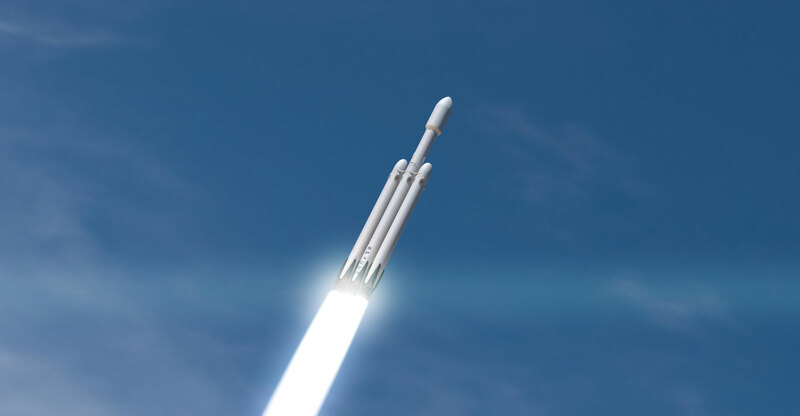 The cost of each Falcon Heavy flight is roughly $90m, more than the $62m price tag for a Falcon 9 launch. That compares with as much as $400m for a Delta IV mission, according to a US Government Accountability Office report. 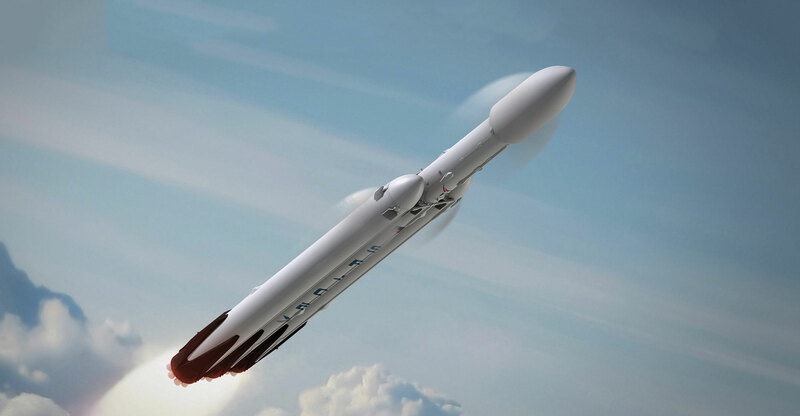 Because of the experimental nature of the first flight, and perhaps as a way to burnish the spectacle, Musk decided the payload will be his personal Roadster sports car made by another one of his companies, Tesla, that will be set to play David Bowie’s Space Oddity on repeat as it’s hurled into the deep beyond. The location itself is part of the story line, with the Falcon Heavy rising up from the same launchpad that send Apollo astronauts to the moon. And while excited space fans are counting down the days until the launch, it’s what comes after liftoff that could be the most exciting. SpaceX, whose driving principle is designing rockets for reusability, will attempt to land all three rocket cores for re-use in a later launch. Two of the first-stage rockets are set to return to land, while the third is expected to touch down on a drone ship. The company has now proven about 20 times the ability to recover the Falcon 9’s first stage on land or on unmanned ships bobbing in the ocean. But the simultaneous three-rocket landing will require rocketry manoeuvers that the world has never witnessed before.